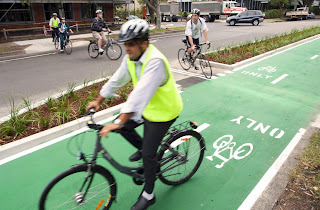 Read the article or take a look at the video about Sydney’s recently added cycle-ways. Here is another article about the economic impact of bicycle lanes, in this case in NYC, which has in recent years been taking a bit of roadway from motor vehicles and giving it to bikes. I have also read about how car parking spaces in Portland OR are being converted to bicycle parking, and retailers are clamoring to get these conversions near their businesses because they value the bicycling customer who has more disposable income from not running a car (and this is in a country in which running a car is very cheap/subsidized).